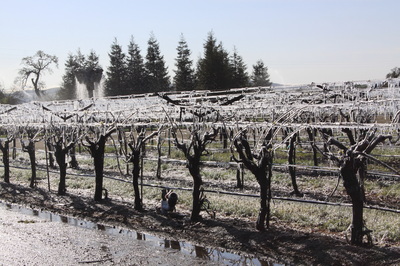 In 2007, our new wine broker asked for a more technical description of our wine styles and winemaking practices, and I realized that some of our customers might also be interested in some of this detail. It was also a chance to once again describe the human elements of friendship and collaboration that I believe distinguish Salamandre wines. While my intrigue with winemaking stems from experiences in the Tuscan hillside vineyards as a teenager, I do not grow grapes. I have tremendous admiration for people who have mastered both of the separate, demanding disciplines of viticulture and fine winemaking. I candidly have no small measure of jealousy about the ability to personally touch all of those determinative steps in the vineyard that lead to fine wine. I think, however, that my profession of medicine and activism in healthcare reform--and secondarily winemaking--leaves no room for a third full time pursuit. I also think that I do the next best thing, which is to have a personal bond with the people who grow the grapes I buy, with the corresponding extra touch of commitment which I believe distinguishes my wines from others made from the same vineyards. At Arroyo Seco Vineyard in Monterey County --a relationship of 30 years starting in my amateur days--not only have I worked with humor and respect with the vineyard managers, Terrel and Roger, I have also provided pediatric care to the children and grandchildren of many of the vineyard workers over the years. I've helped farm workers navigate the exasperating and prejudiced healthcare system of modern California . This turns out to be important beyond the principles of social justice and clinical quality. I often pick alongside the workers, and I observe that they exercise exceptional discretion in their choice of what goes into my lugs. For example, I pick my Chardonnay cold--at the crack of dawn--because I have no refrigeration at Salamandre. Sitting in the pre-dawn dark in the cobbly Arroyo Seco dirt, drinking spiced coffee and catching up on family with the workers, it's different from the typical "patron in a pick up" relationship. Serafin, vineyard foreman and the most knowledgeable vineyardist I know, said in Spanish: "For the doctor today, we pick nothing but la pura seleccion --pure golden clusters, no mugre (schmutz), no green....whatever we leave behind, we'll pick tomorrow for ____ (name of large pushy winery withheld)." There is a quality of human discretion and respect which won't show up on a label, but it's in my wine. My harvest volumes are small, typically 1-3 tons per variety, and that has allowed me to be the "test winery" for a number of experimental plantings at Arroyo Seco and the nearby Wiley Ranch where Roger has planted elite Bordeaux varieties. 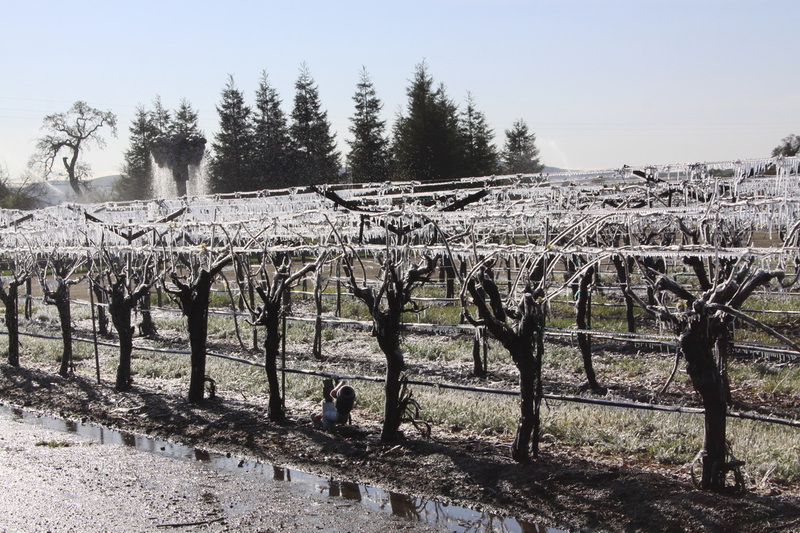 We have shared the zeal to make them show the very best, which then determines whether the vineyard may bud over acres and acres. Sometimes this works out fantastically; other times, it's a learning experience. Either way, it cements our passion for quality and our mutual respect for true excellence. 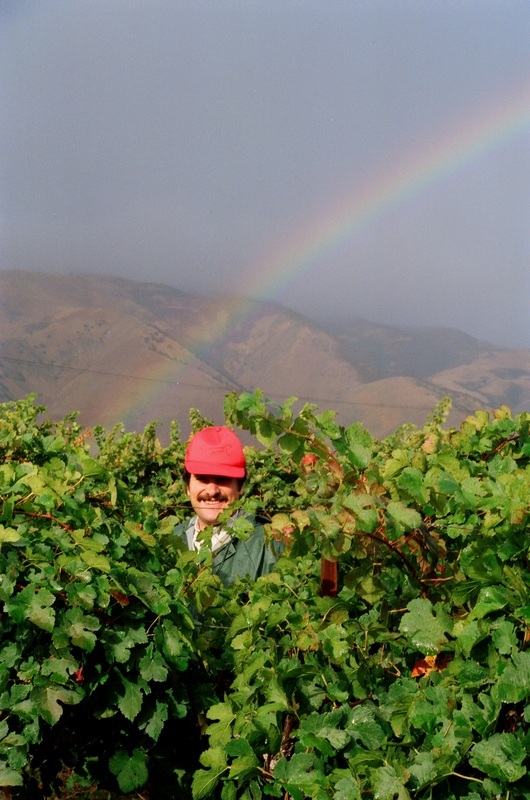 Dante Dettamanti , long time Stanford water polo coach and internationally honored mentor, retired and started a vineyard right on the crest of the Santa Cruz Mountains. I knew Dante through my own long-ago aquatics relationships, and when he approached me to make his grapes into wine, I hesitated briefly…. I thought, well, what does a water polo coach know about grapes, pray tell? Then of course I realized he could ask the same thing about what pediatricians know about winemaking.... I figured, Dante is Italian, he has a masters degree in engineering, he obviously doesn't mind working hard in the cold and the wet, and he has repeatedly demonstrated the ability to make stubborn life forms perform at a high level of coordination and marksmanship. That would have to be perfect for a Pinot grower, and indeed, those are disciplined vines! The quality of the wine reflects our abilities to merge our separate areas of expertise in pursuit of the perfect glass of Pinot. Dr. Bob Weber was the first totally paperless physician in Santa Cruz County , and he has consistently led the way in stretching the boundaries of the achievable quality in Family Practice. When Bob and his wife, Rose, planted a 3 acre Pinot Vineyard on the hillside below his home in Corralitos, he asked if I would do the honors at harvest. What an incredible opportunity. 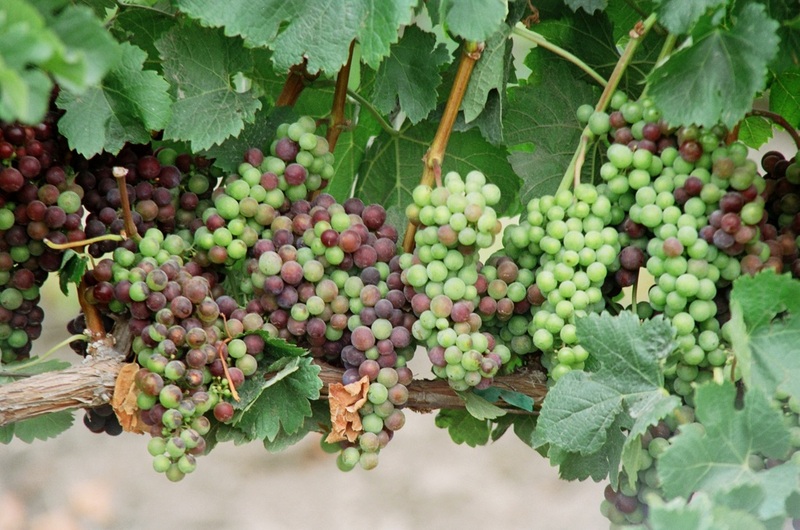 These vines receive the same meticulous care you would expect from one of the most thorough doctors in the region, a doctor who also listens attentively and acts with measured caution. Bob's Meadowridge Vineyard Pinot is our most popular restaurant wine, even at the second harvest, and as the roots probe deeper into the friable soil, the intensity surges every year. In summary, I believe like all winemakers that soil, climate, and attention to viticultural practices are key to great wine. However, for me, a purchaser rather than the grower of fruit, I would add the fourth factor, which is people. I sense the people in my wines, and to be honest, this is the element that brings me back every year. This is a definitive human pursuit, as old as civilization itself. It's made by people for people, always in hopes of a future which includes friends, laughter, music, and cooperation. I have learned from a huge number of people about winemaking, formally and informally, and I've learned a lot from my own experiences over my 30 harvests. I've found several themes to be really helpful: Listening, and candor, especially regarding my own efforts. When I've done something that doesn't work out, I always want to know what I did...and what I might have done differently...because those chances come back around again. In particular, I've treasured the trust, humility, and comradeship among winemakers in the Santa Cruz Mountains . We learn a lot from each other, and the consumer benefits from the way we share. Personally, I like full flavored wines. Of course, I love the flinty austerity of the wines of Chablis, the subtle nuances of the wines of New Zealand , the balance of dry roses from Provence , and the fragrant delicacy of Pinots from Oregon , but the wines I make tend to be full bodied, bold wines rippling with fully ripe fruit flavors. I don't always nail that, but over the years I'm getting better. That usually means I'm harvesting for flavor, which often means picking at 24, 25, or even higher Brix levels, depending upon the variety and the year. 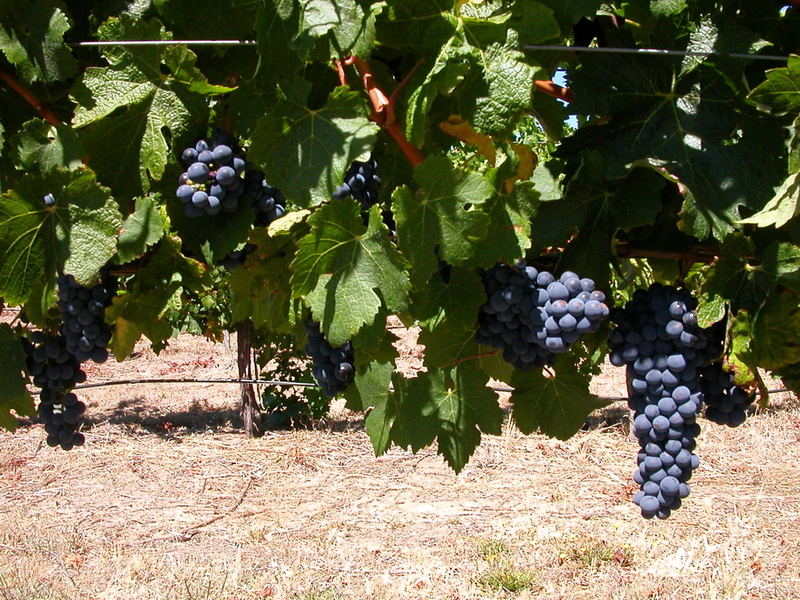 Primitivo, for example usually comes off the vine at 26 to 28 Brix. That can be a problem for grapes that lose acid, or grapes where so much of the acid is malic that the pH rises sharply after malo-lactic fermentation, and we try to adapt. 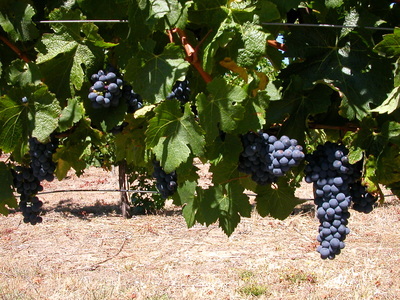 The relatively high sugar levels of these ripe grapes, plus the use of closed fermenters, plus the more efficient yeasts of these days combine to create wines with alcohol levels above 14%, which elicits some judgmental frowns from reporters who have been raised on wines with different structure. I am not trying to make wine to a formula, but rather to the tastes that bring our customers back...and make Sandie and my friends smile. I don't like adding "stuff" to grapes, but I will occasionally use yeast nutrients and grape acids when I feel the wine will suffer otherwise. While I do use sulfites judiciously to prevent spoilage from destructive and distasteful organisms like Lactobacillus and Brettanomyces, I keep that to an absolute minimum. I press white wines immediately--I'm just not convinced that skin contact does anything worthwhile, and I've had some bad experiences with browning and bitterness. We use an old fashioned basket press, which frankly couldn't overpress the grapes even if I was silly enough to try. We do lose some volume, but what we get tends to be beautiful. I use cultured yeasts. I think that if I had my own vineyard and could strew the pressed pomace among my own vines every year, I would trust the natural yeasts on the skins. This gets to be a discussion of beliefs among proponents of "wild yeast" fermentations, and I have certainly seen fabulous results from that in the hands of others, but it's too big a risk for me. I ferment the red wines in closed containers, since I just don't trust oxygen, fruit flies, and raccoons with my must. I like to press before complete dryness to allow the elaborating CO2 to continue blanketing the wine. I honestly don't see the point in extended fermentations, once upon a time quite the rage, as I believe this only adds extra tannins without contributing extra charming fruit flavors...at least in my hands. If a wine lacks tannin, I'd approach that with blending, not leaving the skins soaking in the wine for an extra few weeks. Frankly, I don't have the room to do that, anyway. If a wine is sound, but missing something, I prefer to approach that through blending, rather than manipulation. If a wine is not sound, I'll quarantine it, and in general, the public won't ever see it. The general rule is that blends should be better than either constituent, and some of my happiest efforts have been blends, rather than purebreds. 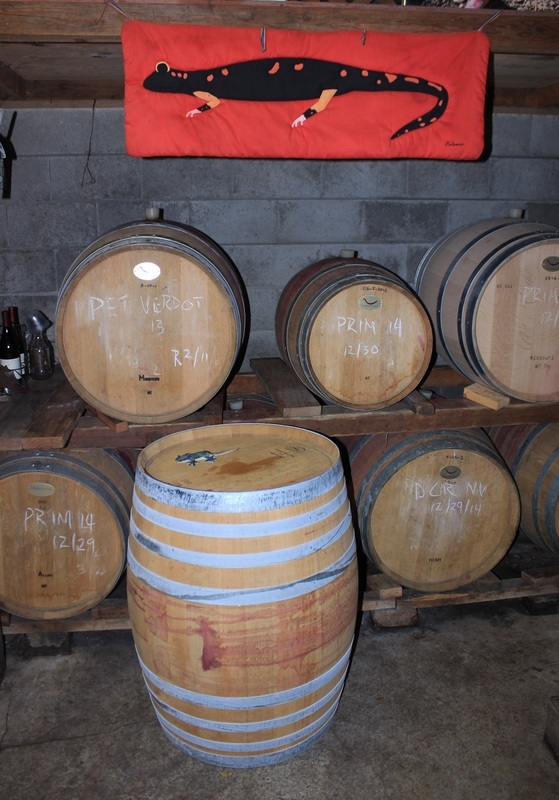 I ferment and age Chardonnay in French oak, and use French oak exclusively for Pinot Noir. However, for Primitivo, Syrah, and the Bordeaux blends, I like American oak, with a minority of French. The American vanilla flavor, in a well made, medium toasted barrel, is just something that I believe naturally augments the rich berry and plum flavors of those varieties. I age wines to accomplish several goals. 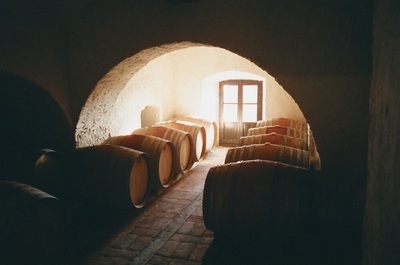 Clarification, completion of the biological steps such as malo-lactic fermentation, and some softening of the tannins. Oak flavor enters wines at different rates for different varieties, different oaks, and different age barrels, so this is one area where regular assessments make a real difference. Once those tasks are complete, I'll bottle. I tend to crave bright, fresh fruit flavors more than the satiny quality of 2-3 years barrel ageing, and that's what I try to deliver. My father is a filtration engineer, and I know he'll not like this statement, but I really really try to clarify my wines with natural settling, rather than filtration. Sometimes I have no choice, but I'm only filtering wines every 2-3 years now. 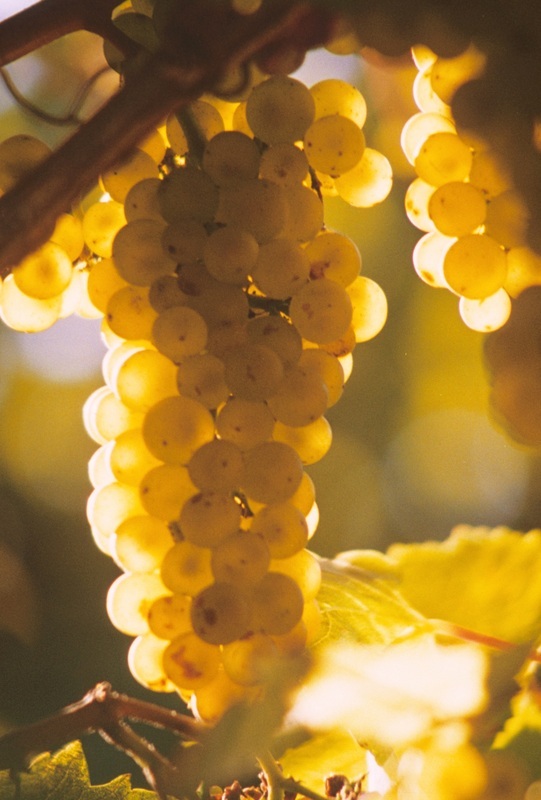 Frankly, I like younger wines, even of the varieties traditionally "laid down." While I have Pinots that are holding up beautifully from 1982, 1992, and 2002, I mostly prefer the 3-5 year old Pinots to accompany a meal. Syrah--3-5 years, although my 10 year old Syrahs are still fruity and sound. Primitivo--well, these do take 2 years in barrel, but I like them still wriggling, starting at 2 years and so far, stretching out beyond the horizon of time. I think these will age like Ports, but I like them young and overflowing with fruit. I'm new at the Coyote Cuvee, our Bordeaux style blend, but the 2004 Coyote is doing nicely at 3 years, probably will peak at 6-8, and will live a distinguished career at least as long as my Merlots, which are velvety but still fruity at 12-15 years. I must agree with the Italian winemaker from Montalcino who told me in 1994: "It is very very rare for a red wine to truly improve after 10 years of age. There are some exceptions, but the greater sin is to open a delicious bottle of wine 5 years after its time of triumph." 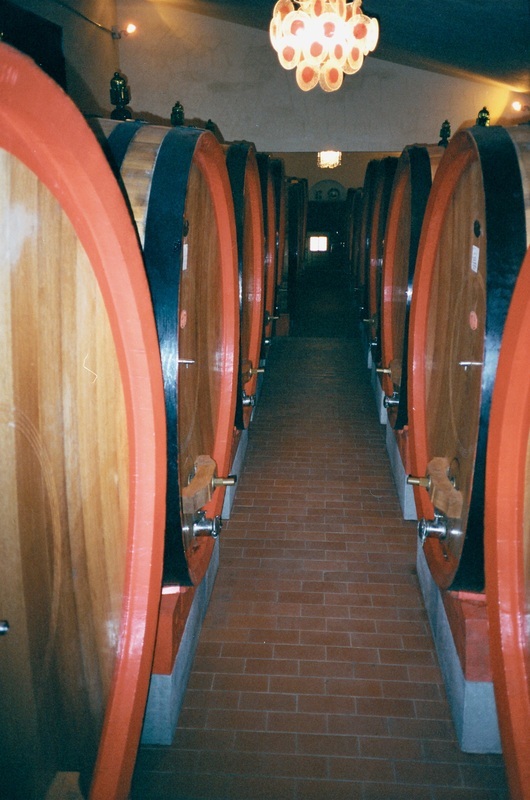 For a more detailed description of wine ageing, please enjoy this article from 2015. We have a very small winery with a reputation for high quality wines with fair prices, plus a cheerful presentation where we don't put on snooty airs. 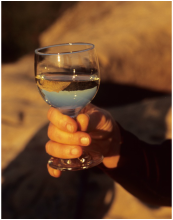 I want to sell wines that taste good outdoors, but which would also please a Bostonian professor or a French author or an Australian naturalist on any fancy table. The one thing Salamandre could not survive, economically, would be to sell a flawed wine at any price, or to sell a mediocre wine for a high price. Those would become customers I'd never see again. There are too many superb wineries in California , Australia , Italy , Chile ...you name it... to ever patronize one which passes off undervalued stuff. The fact that some may get away with this and thrive on hype or past glory makes no difference to me, and I'm not jealous of such wineries. If I am not happy with one of my wines, or not willing to slash the price commensurate to its value, or not able to make it better with artful blending, then it will simply never appear on my list. We have ways to dispose of such wines.... This is one reason that I am looking very intently at moving to screw-cap closures. The quality is simply better, and definitely more reliable. I don't have the practical ability to switch to screw caps now, and yes, I'm aware of the marketing prejudices, but the time will eventually come. Another thing needs comment. I'm a doctor, and I have written part of a book, authored many trade articles, and done a lot of public speaking on the health aspects--negative and positive--of moderate consumption. I am also acutely aware of the short and long term consequences of excessive drinking in our society. While I enjoy the spirit of mischief and laughter with moderate drinking in safe circumstances, I absolutely never want to suggest that intoxication is either a virtue or a goal of the use of my product. I don't want to create even a glimmer of a wink that over-drinking is OK in any circumstance with any product. This is part of my "brother's keeper" social responsibility, as well as a family value. Both of my parents were teetotalers, but I spent the first 5 years of my life near Asheville , North Carolina , the moonshine capital of North America if not the universe. Environment trumps heredity, I guess. I lived in Florence at age 19, and I became fascinated by the culture of respect for the history and the health of the land, the adaptive marvels of Mediterranean agriculture, the family coherence between generations, and integration of wine with civilized living. Drunken oafish behavior, so commonly pursued among my peer group in those ancient times, was notably regarded as the mark of a hopeless dweeb to whom no gracious rewards would flow...from either friends or the ladies. I started making wine with a small group of doctor friends in the late 1970's, and as our interests evolved and diverged, I wound up the one who wanted to make more wine, more ambitious styles, more interesting varieties. I wound up bonding Salamandre as commercial winery in 1985. In 1986, I was joined by one of the amateur partners, Dave South, and we have enjoyed a fabulous friendship and partnership ever since. My three grown daughters all speak at least 3 languages, and all have spent long stretches overseas. Wine has never held a "forbidden fruit" novelty for them, and they have observed directly how to sensibly and artistically integrate wine with pleasant, responsible living. One daughter rarely touches wine, actually, but she knows an extraordinary amount of technical detail about how it's made. Another drinks lightly, although with great discrimination. She has documented the processes and the friendships through her professional medium as a photographer. The other, the fluent French speaker and international traveler, knows the faces and moods of wine better than anybody I knew at her age. Sandie, my wife, is my chief critic and reality grounder. Her scrutiny is another element of quality control which won't appear on the bottle, but which should be represented with some kind of seal! She also keeps us solvent, and helps me tend to the Nalgene flasks of Primitivo we take to the wilderness together. I'm hoping to make wine until my ability to manipulate barrels, tip tanks, drive trucks, and cope with wet ladders reaches the point where safety would dictate passing the baton. That statement is just pro forma. After doing a whole crush with a broken leg in 1996, let's just say we're confident that we have lots of years to go.